In the year 2000 my 1986 Camaro turned 14 years old and was starting to have a renaissance of interest. I'm guessing enough time had passed that the stereotypes had been forgotten... or at least forgiven. We'll go with forgiven. Either way, an 80's Camaro became something to find. There are other cars like it. Monte Carlo's and Hurst Oldsmobile with t-tops to name a couple. Pretty mundane cars at the time considering what had come 14 years before them in the late 60's. So where are we now? 2010 the calendar tells me. What are the cool kids looking at now? 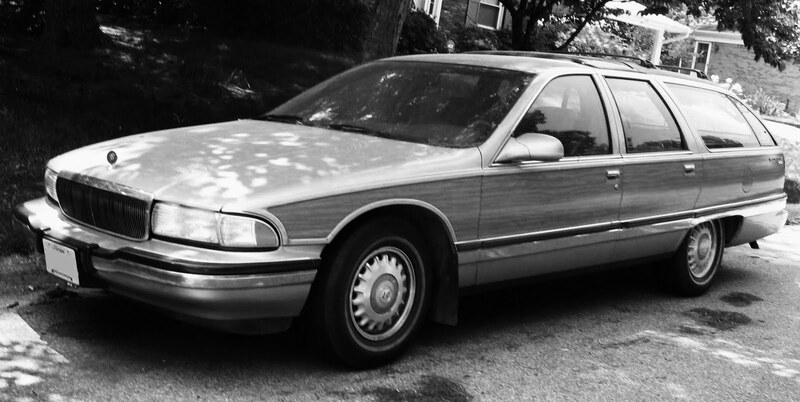 Why... a 1996 Buick Roadmaster Estate Wagon Limited of course. This sweet little puppy has a V8 260 Horsepower – Corvette LT1 Engine hidden in it and is part of the appeal. Combine that with a low cost and its now alien look and whambam! you have a car you can find ways to love and it may even qualify as, to use a phrase a friend once told me, "a mean MAAchine". It's never what you think. Go figure. And now I want one. It's interesting to think of auto history in this way. It takes me back to GM's planned obsolescence that I've mentioned before. They aren't making a dime off the sale of a 14 year old $2000 car, but they sure are desirable to some people and, in this case, hold a few surprises. I'm not saying the new GM slogan "Chevy Runs Deep" takes into consideration a 1996 Buick wagon... but maybe it should. Add a pretty girl and a burnout and that sucker will get ingrained permanently and positively in American's heart and souls.